You do exceptional things in the classroom every single day. NCTE is here to recognize them. Paul B. Janeczko has published 40 books in the last 30 years, including poetry compilations, non-fiction guides for young writers, and books for teachers. His books include The Death of the Hat: A Brief History of Poetry in 50 Objects; Firefly July: A Year of Very Short Poems; Hey, You! Poems to Skyscrapers, Mosquitoes, and Other Fun Things, Birds on a Wire, or, a Jewel Tray of Stars (with J. Patrick Lewis); Kick in the Head: An Everyday Guide to Poetic Forms, Dirty Laundry Pile: Poems in Different Voices. Nomination are not accepted for this award. 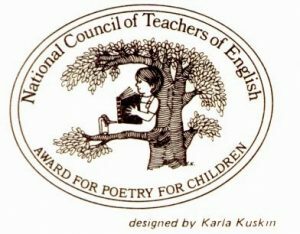 NCTE established the Award for Excellence in Poetry for Children in 1977 to honor a living American poet for his or her aggregate work for children ages 3–13. NCTE also recognizes and fosters excellence in children’s poetry by encouraging its publication and by exploring ways to acquaint teachers and children with poetry through such means as publications, programs, and displays. Literary Merit (art and craft of aggregate work–as poet or anthologist). Creating books of poetry that demonstrate imagination, authenticity of voice, evidence of a strong persona, and universality/timelessness are essential. In short, we are looking for a poet who creates poetry books that contain clean, spare lines; use language and form in fresh ways; surprise the reader by using syntax artistically; excite the reader’s imagination with keen perceptions and sharp images; touch the reader’s emotions: a maker of word events. Poet’s or Anthologist’s Contributions. Aggregate work, evident potential for growth and evolution in terms of craft, and excellence are considered. Evolution of the Poet’s or Anthologist’s Work. Technical and artistic development as evidenced in the poetry, evidence of risk, change, and artistic stamina, and evidence of different styles and modes of expression are considered. Appeal to Children. Although the appeal to children of a poet’s or anthologist’s work is an important consideration, the art and craft must be the primary criterion for evaluation. Evidence of students’ excitement for the poetry and evidence of childlike quality, yet poem’s potential for stirring fresh insights and feelings should be apparent. The award is presented in even years by the chair of the NCTE Poetry Committee at the Children’s Book Awards Luncheon during the NCTE Annual Convention. The award recipient receives a plaque, is a featured speaker at the luncheon, and is invited to present at a poetry session during the NCTE Annual Convention. The award was given annually until 1982 and every three years until 2009. In 2008 the criteria was updated and time frame changed to every other year. Members of the NCTE Poetry Committee determine the award recipient every other year and select notable poetry books each year. Learn more about the NCTE Poetry Committee and apply to be a member. A collection of poetry books from all the winners of the NCTE Award for Excellence in Poetry for Children is sustained and preserved at the University of Minnesota Children’s Literature Research Collections (CLRC) / Kerlan Collection at the Andersen Library. Books must have been published and/or distributed in the English language during the calendar year. Bilingual books are also accepted. Nominations of individual books may come from publishers, the membership of NCTE, and from the educational community at large. Any poetry title for children ages 3-13 is accepted. This includes all forms of poetry including individual poetry, anthologies, narratives, biographical poems, and verse novels. Content that is interesting to and understandable by intended readers. Language is innovative, with careful word choices and uses of poetic devices to enhance meaning. Form or structure helps readers understand more about the poetic subject or mood. Purposeful selection of quality poetry. Inclusiveness of a range of poetry. In addition, if an old collection or anthology has been recently published or reissued, it must have a new perspective, fresh approach, and/or newly illustrated to be considered as a new collection. The poetry in picture books must incorporate poetic language that exemplifies figurative language, that demonstrating depth rather than simply rhymed couplets. A narrative told in poetic form. Format enriches the story in some way. Nominations must be submitted to the Award Committee by November 1. One copy of each book nominated should be sent to the committee members for examination. Advanced copies or galley proofs are acceptable. Contact bookawards@ncte.org for award committee member information to nominate a book.